Grand Complete is a broad-based supplement that supports joints, hooves, and coat. 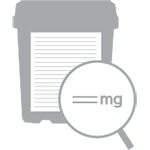 Grand Complete provides 2,500 mg of glucosamine, 2,500 mg of MSM, 2,500 mg of vitamin C, 10 mg of biotin, and 3,000 mg of methionine, along with antioxidants, yeast, and minerals. Grand Complete also provides omega 3 and 6 fatty acids from soy and flaxseed, to help promote a shiny coat! Grand Complete is rated 4.5 out of 5 by 132. Rated 5 out of 5 by Amy Kay from Love it!! My 31 yr old QH mare has been on this for 12 yrs. I have to show people her papers because they don't believe she is that old!! Even my vet is surprised she is in such good shape. We used to have hoof abcesses in the summer, since we started Grand Complete no foot problems!! I would recommend this to anyone! Rated 5 out of 5 by Tiarantula from Best calmer I have a half Arab with a sketchy past before I rescued him... He has a short attention span. I have tried 2 other calmer from smart pack that did not work as well... So I am switching back to this one. I should have never tried something cheaper... Lesson learned. Rated 5 out of 5 by Hurd45 from I love Grand Complete I have been using Grand Complete for a couple months after trying other supliments I came back to GC. My horses shine and health are amazing. 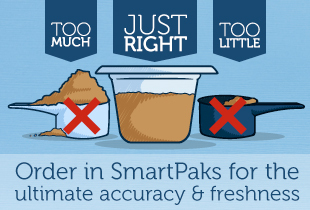 I use to buy the tubs but the smart packs are cheaper. Great product. Rated 3 out of 5 by UseYurHeds from Attracts flies I had my two horses on this and noticed they had a lot of flies on and around their feed buckets. Other horses in the barn did not. When I ran out and grabbed another product at the feed store, I noticed a few days later that the flies were all but gone from their buckets. Then a friend who had recently started feeding Grand Complete mentioned terrible flies where her horse eats, but the horses around hers had none. I told her to stop the Grand Complete, and the flies are gone. I think it's a good product but there's an ingredient that attracts flies. Wish I knew which ingredient is the culprit so could avoid in the future. Rated 3 out of 5 by Peppellie from Non-picky eater, but wont eat this :( I was looking for a supplement that had everything I wanted in it, was affordable, and had good reviews- Grand Complete was my best option. After the first week I noticed my horse, who thinks he is always starving and not picky, wouldnt finish his grain. I tried adding water, molassess. Last night I scooped out probably a weeks worth of uneaten suppliments. So not only can I not see how it works but in an effort to pinch a penny, I wasted the money. Cant win'em all I suppose, so back to pelleted suppliments. Rated 5 out of 5 by prissypatty from It seems to meet up to its name! I can tell a difference in my riding buddy since adding this product to his diet. Rated 5 out of 5 by Vicki from Great I am feeding this to my yearling stud colt and he is looking great. Shiney coat, filling out nicely. Rated 5 out of 5 by ooblie18 from Made great improvements! I've been using this for 2 months now along with Smart Tranquillity. My 17.1 hand thoroughbred has some joint issues in his left hind leg and would continuously be off on that leg whenever I would warm him up. He would also buck or take off when picking up the right lead because it would be painful for him. After a month of being on Grand Complete he hasn't looked off once and picks up the lead no questions asked! He also absolutely loves the taste of it and refuses to switch grain with his pen mates anymore! Rated 5 out of 5 by HorseLady7 from Quick Results Seen I have seen a noticeable improvement in my donkeys coats in the past two months. I am very pleased. Rated 4 out of 5 by Bayparty from Quality Product, Not Suitable for Some I bought this product for my two high A/O show jumpers as an additional supplement to their grain. They can be picky but they eat this no problem. Ingredients seem of high quality, however, there is minimal amounts of each therapeutic ingredient per serving. I cannot get certain Smartpak supplements in Canada so I purchased this (which is CAD$100 for 28 day supply btw! *gasp*). I will not continue to use the product once I am back in the U.S. because there are much better all-in-one supplements for competition horses in heavy work (SmartSuppluments, amazing!). Would highly recommend for a horse that does not require high levels of joint support and/or hoof support or possibly just needs minimal supplementation. I did see a slight improvement in my horses coats, though, and it is very convenient to only have to feed one supplement rather than 3.